Large screen TVs are no longer a luxury at least not for the past decade. Large TVs are fairly common and affordable. This enabled a whole new industry to develop. What we now call home cinema systems are basically large TVs and a home theater system. Superior image quality is not paired with superior sound quality and the vast majority of people can afford to have a small cinema in the comfort of their own home. Today we will get into the details of what makes a great home theater system and what offerings the market has. A good home theater system must offer high fidelity sound and a good coverage of audio frequencies. This means bass, mids and highs. To achieve this, a multi-speaker system is preferable like a subwoofer and satellites. Most home theater systems come with their own built-in amplifier and they are optimized for movies but they can still play music while still offering an immersive listening experience. What comes next is our selection of home theater systems that are worth checking out. Right from the gecko, it becomes obvious that there are several brands that simply dominate the market. Still, there is a great deal of diversity and products for any budget. Like with everything else, higher quality sound means spending more money. It is also worth noting that a good home theater does not have to be loud and have a high wattage. Sound quality is more important than power when it comes to enjoying a movie. Now that all these things have been cleared it is time to check out what we deem purchase worthy. Here is our selection for the top 10 best home theater systems in 2019. Onkyo HT-S3800 is quite surprising for such an inexpensive home theater system. It comes with an individual amplifier and a 5.1 channel speaker system with 105 watts per channel. The system supports Dolby TrueHD as well as DTS-HD audio decoding. One interesting feature is the auto room calibration which tweaks the sound for optimal experience. Last but not least the system offers a wide range of output options and is recommended for small living rooms or home offices. The Onkyo HT-S5800 is a powerful home theater system that comes as a complete package. This particular kit includes the 5.1 channel speakers and a dedicated amplifier. Each speaker has a power output of 115 watts while the amplifier is capable of Dolby TrueHD and DTS-HD decoding. The system also supports Bluetooth wireless audio streaming and comes with an advanced music optimizer that tweaks the sound for a better listening experience. 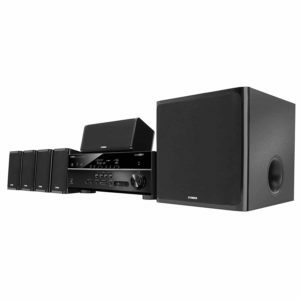 Samsung HT-J5500W is a great 5.1 watt audio system. It is not that expensive and it is quite powerful. The system is capable of an output of 1000 watts and supports Dolby Digital and DTS Digital Surround. In terms of connectivity options, the system has 1 USB, 1 HDMI out, 1 Digital Audio. It also supports a Wi-Fi connection and Bluetooth audio streaming. As for playback, the home theater system has a Blu-Ray player and support for 3D movies. Onkyo SKS-HT540 is one of the few 7.1 systems that managed to get into our list. Each speaker has a 130 watt output with 2-way bass reflex and a 5-inch 230 watt subwoofer. The system is fairly easy to setup and only takes a few minutes to get ready. Amplification is built-in into the subwoofer which will save space and reduce the amount of cables. As for sound quality, the home theater system works great for movies and listening to music. Everyone would expect a 7.1 system to sound great. The Onkyo is a great home theater system but the drivers used are not that great. It is still a good system and sounds great especially for movies. Music is still enjoyable but for the money the sound quality should have been better. 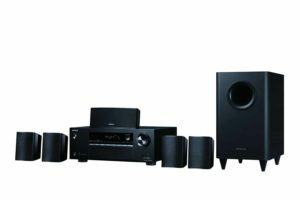 Yamaha YHT-3920UBL is a great home theater system that offers some of the best sound quality for a decent price tag. It is a 5.1 speaker system with a dedicated amplifier and plenty of features. The model supports Bluetooth audio streaming and Virtual Cinema technology. It offers extra bass which enhances listening experience and has more than enough sound optimization options. The system is quite loud and it should be more than enough for a medium to large living room. The kit includes all the required cables to set it up properly. The only issue is that the quality of the cables and the connectors is fairly poor. It takes a bit of work to secure the wires properly and ensure that they will not come out accidentally or that they actually make proper contacts. Yamaha YHT-592UBL is a great pick for the ones that are seeking a true cinema experience. The sound system has a 5.1 setup with a large subwoofer and a dedicated amplifier. It support high-resolution audio as well as Bluetooth audio streaming. The system can be connected to a wireless network, to a TV, media player or an entertainment system. Each speaker comes with a glossy black enclosure and a long wire to make it easy to place anywhere around a room. The issue with poor quality wires seems to be something common for Yamaha sound systems. Their connectors are also not that great. It takes a bit of effort to get everything properly connected. Fortunately, the speakers can use almost any type of standard audio wires. 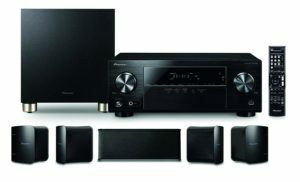 Onkyo SKS-HT993THX home theater system is one of the more expensive versions offered by the manufacturer. They are an extremely powerful 7.1 channel system with each speaker having an output of 130 watts and a 125 watt subwoofer. The speakers are THX certified meaning that they offer superior sound fidelity. Their wooden enclosure helps a lot in terms of sound quality. Being quite loud, the sound system is more than enough for a large living room or even a small venue. The wires that come with the system are quite short. In order to place them a bit farther apart, the wires need to be replaced. Fortunately, longer wires are easy to find and inexpensive. The ones that come with the system might be suitable for the center speaker and subwoofer but for the rest of the speakers, longer wires are required. Pioneer is a well-known brand especially for the quality of their sound systems. 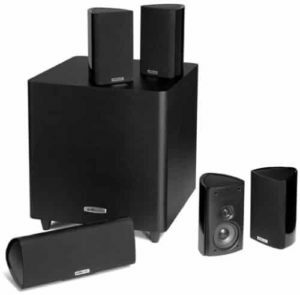 The HTP-074 home theater system is a great pick for both regular users and audiophiles. It uses 5 compact 150 watt speakers and a 100 watt subwoofer. The system comes with a 5.1 channel receiver that also supports Bluetooth audio streaming. In terms of sound quality, the receiver supports Dolby TrueHD, Dolby Digital Plus and Dolby Pro Logic II decoding. Last but not least the system supports HDR and it is 3D ready. Usually, HDR works over HDMI and that is to be expected since there are TVs that support HDR. For some odd reason, Pioneer decided that HDR should work only using an optical cable. It will not work over HDMI and that is quite unexpected. 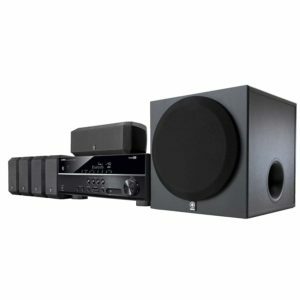 Polk Audio RM705 home theater system is one of the best recommendations for the ones that have a limited budget. It is a simple 5.1 system with decently loud speakers and good sound quality. The speakers are magnetically shielded which is a major plus and have a non-resonant enclosure. They are quite compact and simple clips for the wires in order to place anywhere around the room. Also the have wall mounting brackets and a high-gloss black finish. For some other reason, the system does not includes wires. Most other home theater speaker systems do have the required wires included but not the Polk Audio. This is extremely odd especially since wires are very cheap. They can be purchased separately and they almost cost nothing. Sony BDVE3100 5.1 channel home theater system not only sounds great but it is also quite affordable. It is a 1000 watt system with a powerful subwoofer and several useful features. The system supports video streaming as long as it is connected to a wireless network and can play music wirelessly over Bluetooth. The subwoofer has full range bass reflex and does not distort even at high volumes. Last but not least, the player can upscale video quality to Full HD and supports a wide range of inputs. The player can handle Blu-Rays and DVDs without problems but the Netflix and other streaming websites it supports, have a few issues. The thing that will bother most users is that the system forgets credentials after a while. They will just need to be setup again by the user when this happens. 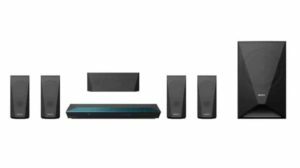 5.1 or 7.1 system: 7.1 systems are stated to offer a better movie experience because of how the speakers can be arranged around the room. While it might sound impressive at first, it is important to note that there are not a whole lot of movies that actually support 7.1. The experience is emulated at best. Also, 7.1 systems mean additional wires to deal with. With or without a Blu-Ray player: Some home theater systems only include the speakers. Others may include a Blue-Ray player. In the end it is up to the user as some might already have a player at home. Wireless speakers or wired: Wireless speakers are not exactly wired. They still need to be powered. Also, they can get desynchronized. In all honesty, wired speakers are still the best option mainly because they are much more reliable.